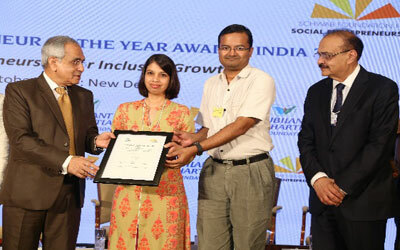 The Schwab Foundation for Social Entrepreneurship, the sister organisation of the World Economic Forum and the Jubilant Bhartia Foundation of Jubilant Bhartia Group announced Prema Gopalan of Swayam Shikshan Prayog as the winner of the Social Entrepreneur of the Year India 2018 Award. The Award was presented by Dr. Rajiv Kumar, Vice Chairman, National Institution for Transforming India, NITI Aayog, Government of India in the presence of over 150 participants in New Delhi. The SEOY India Award 2018 winner Prema Gopalan, is revitalizing rural economies by putting women in charge. Working in areas affected by global climate change, it has unleashed women farmers, entrepreneurs and grassroots business leaders who are solving the problems of their communities through small businesses. Prema Gopalan and her team have built vibrant eco-systems to enable 145,000 women to succeed in remote and ailing markets. The SSP model comprises four ventures: a federated network of 5000 SHGs; a resilience fund for women-led businesses; a rural school of entrepreneurship and leadership for women; and a market aggregator that provides warehousing, branding, marketing and distribution services to last-mile business women. In addition, it has catalyzed the government, investors, financial institutions and Indian and global corporations to partner directly with grassroots women business leaders. The SEOY India Award promotes social entrepreneurs in India by recognising organisations that work to promote inclusive growth and contribute to bring change in the society through their entrepreneurial vision. 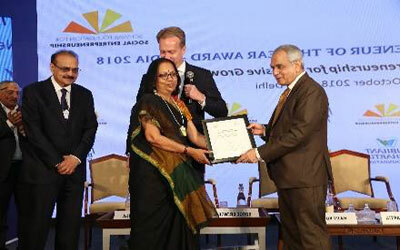 The winner of SEOY India Award participates in the annual and regional meetings of the World Economic Forum (WEF). These meetings offer unprecedented opportunities to engage with global decision makers from the public, corporate, media, academic, and civil society sectors. The winner will be invited to join the World Economic Forum Network - Group of Social Entrepreneur. Rang De is building bridges between India's credit-starved communities and 'citizen social investors'. As the architect of India’s first peer-to-peer lending platform, Rang De has blended elements of micro-lending with crowd funding to transform 14,000 ordinary citizens into social investors and philanthropists. These ‘ordinary’ funders and changemakers have contributed more than 70 crore rupees for ultra poor families in the form of affordable and customized loans (at 2-10% interest). More than 65,000 families have had their health, education and enterprise needs met through the Rang De model. They have recorded 70% increase in incomes and 108% increase in savings. Working much before crowdfunding became a buzz word in India, Ram and Smita have opened up untapped channels of capital for India's poorest. Buoyed by the passionate engagement of their social investors and changemakers, and to reach the vast majority of India’s poor, Ram and Smita are taking the next logical step of scaling their model by setting up a Non-Banking Financial Company. The Social Entrepreneur of the Year Award celebrates mature-stage social entrepreneurs and their organizations that implement innovative, sustainable and large-scale solutions to address poverty, indignity and the lack of basic services and resources in ‘Bottom of the Pyramid’ and ultra-poor communities. They work in areas as diverse as health, education, job creation, water, clean energy and building identity and entitlements and access to information and technology. Whether they set up social businesses, hybrid social ventures or not-for-profit organizations, the primary focus of social entrepreneurs is large-scale, transformational impact. This is a unique opportunity to connect with business executives, key government leaders, civil society members and media representatives of the region. The Winner(s) will be announced at an Award Celebration in New Delhi. The registration fee, flight and lodging for all Finalists will be covered.